Redesign Group is a multidisciplinary design practice with four global office locations servicing many regions around the world. We are market visionaries consistently providing new and innovative design solutions and technologies that meet our clients’ needs and captivate their audiences. 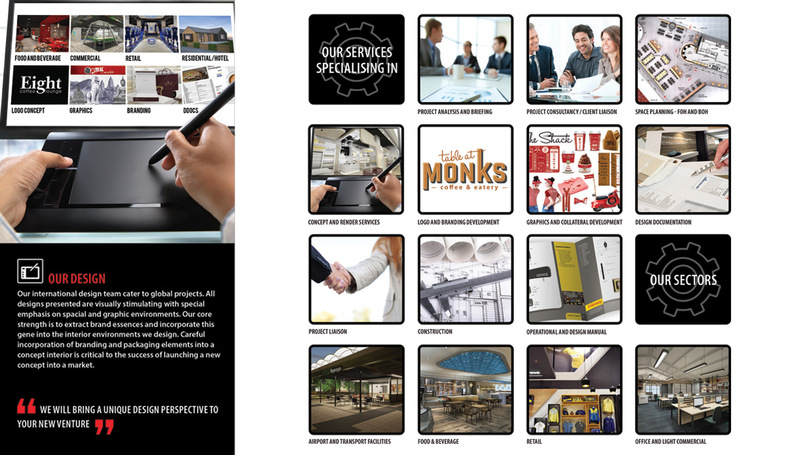 Our specialist team of designers work across many disciplines including spatial design, retail, food and beverage, commercial office planning, airport and mall interior design, graphic design and branding, franchise set up and management, project management and construction. In these areas of expertise Redesign Group captures the essence of the clients business and creates an environment that expresses character and strength. Each project embraces the company’s history, branding vision, functionality and principles. Respect for cultural and environmental needs are carried out through necessary research and incorporated into every project. With an emphasis on brand recognition and identification, each project is designed to ensure that the customer or end user enjoys the space and carries with them an understanding of what the brand portrays. This ensures the brand meets its overall marketing and communication objective. With this philosophy Redesign Group is able to deliver unique spaces that encourage repeat business and customer satisfaction. We are focused on the client and their expectations from us as a design practice… striving at all times to make the client happy and provide them with a superior service and space. We believe in our relationship with the client and take time to build a trust. We respect other cultures, which reflects in our design and our work. We build our business on the word trust. We trust our teams to deliver a great design, we trust our contractors to build what is on plan into reality. In return we gain trust from our clients. Our track record illustrates this by way of repeat business and the referrals we receive.